Paneer pulao is an easy and famous Indian Lunch box or a party recipe, which is loved by most of the people. The cottage cheese when cooked along with the rice, gets a nice flavor and tastes great when served with spicy side dish. Paneer pulao recipe with easy step by step instructions for your easy understanding and learning. Though I am a Paneer lover, I have not posted much paneer recipes. This Pulao, I did long before and was in my draft. Paneer without any veggie also tastes great either in pulao or in any gravy when added. 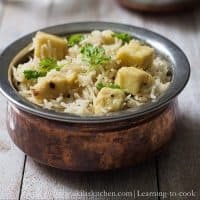 This is one such easy one pot meal, which can be prepared in a jiffy, if the paneer is readily available and tastes great. 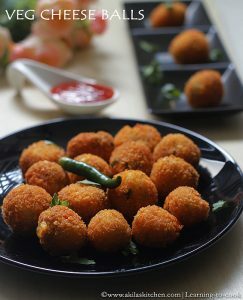 You can try different paneer recipes here and have given some pulao recipes to try from my blog. 1. Wash and Soak rice for 20 mts. While the rice is soaking, you can start preparing the following. In a Pressure cooker, add oil and fry all the spices mentioned above. 3. Add in the peas and fry for a min. Add the paneer cubes now and fry for a min again. (if you want, you can fry the paneer cubes separately in ghee and add now). 4. Add the water and when it starts boiling, add the soaked rice. 6. 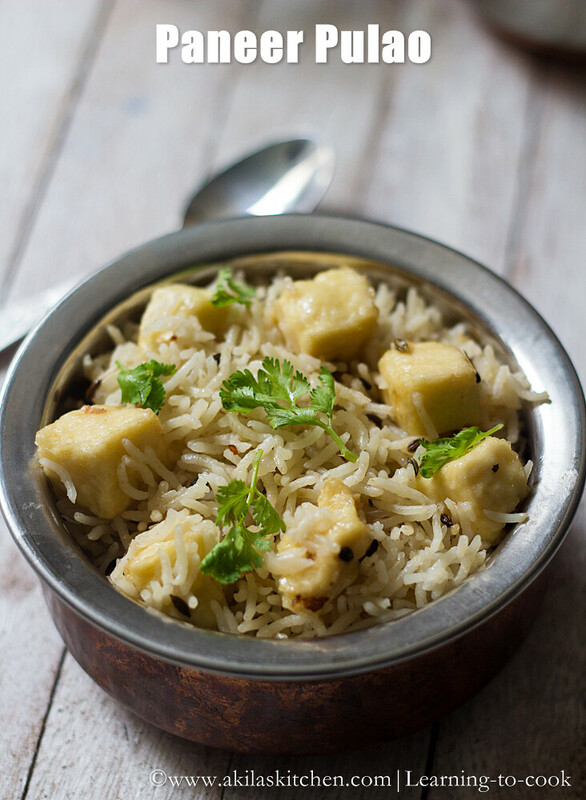 Garnish with coriander leaves and serve the hot Paneer Pulao with Soya chunks masala. 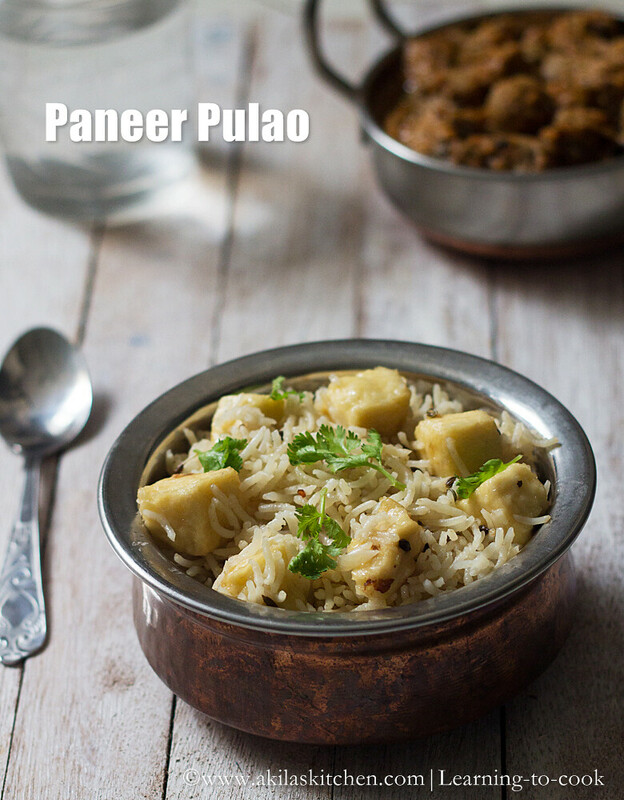 Paneer without any veggie also tastes great either in pulao or in any gravy when added. This is one such easy one pot meal, which can be prepared in a jiffy, if the paneer is readily available and tastes great. Wash and Soak rice for 20 mts. While the rice is soaking, you can start preparing the following. In a Pressure cooker, add oil and fry all the spices mentioned above. Add the onion and ginger garlic paste and fry till golden brown. Add in the green chillies too. Add coriander leaves and salt and saute well. (At this stage you can add the mint leaves too). Add in the peas and fry for a min. Add the paneer cubes now and fry for a min again. (if you want, you can fry the paneer cubes separately in ghee and add now). Add the water and when it starts boiling, add the soaked rice. Close the lid and simmer for 10 mts. (cook in low flame) After 10 min, switch off the stove and when the pressure goes off, remove the weight and mix the pulao gently taking care not to break the rice. Add the ghee at this stage and close the cooker lid for 3 min. 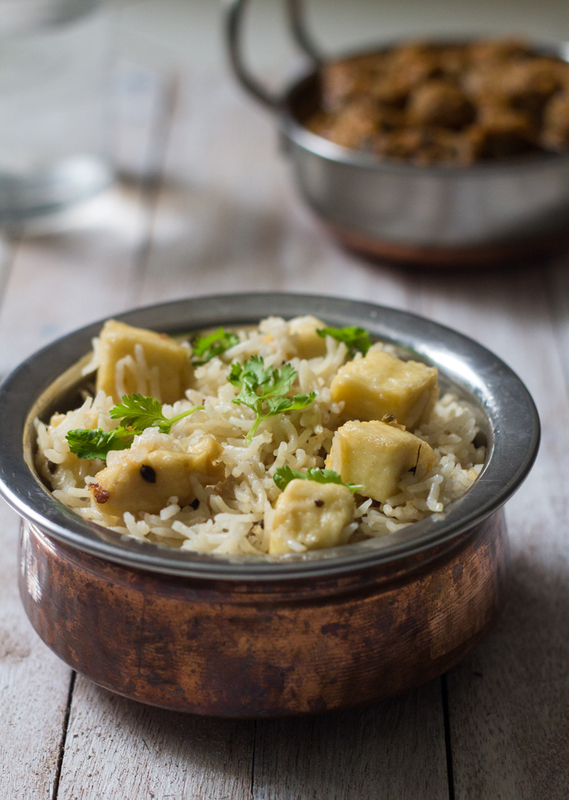 Garnish with coriander leaves and serve the hot Paneer Pulao with Soya chunks masala. Soaking Basmati Rice for 20 minutes, gives a nice lengthy rice. *Post first published on March 2nd 2015. Updated with recipe. Give me a rice dish and I will never ever complain. This yummy pulao is definitely included.